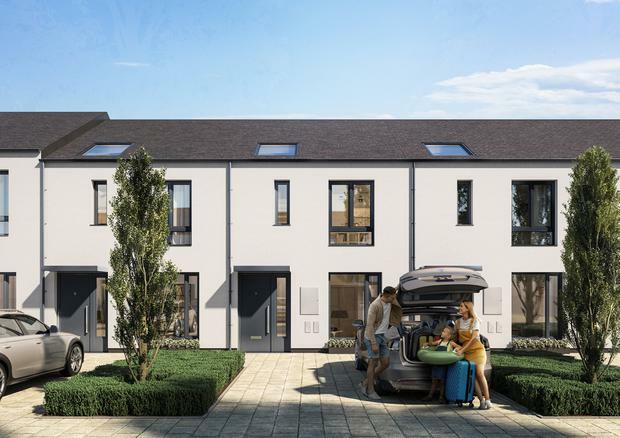 Newpark will this weekend become the latest in a series of developments aimed at first-time buyers to be released in Adamstown, Ireland's first planned town since Shannon in the 1960s. It follows the 2016 launch of Alderlie and the 2017 release of St Helen's, both of which were developed by Castlethorn Construction. Newpark is being built in the west Dublin town by D|RES, a joint venture formed last year between Durkan Residential and Hudson Advisors Ireland. Like its predecessors, the 92-unit scheme will likely prove popular with novice buyers priced out of locations closer to the city, especially those seeking to avail of the help-to-buy scheme before it expires at the end of the year. All 30 homes in the first release are expected to sell off the plans when they launch tomorrow because prices start at €300,000 for a three-bed. At 1,024 sq ft, it's a tad smaller than standard three-bed new-builds. Prices for the larger three-beds, which span 1,200 sq ft, start at €315,000, while the 1,564-sq ft four-bed homes are priced from €375,000. Newpark is near facilities such as a preschool, primary schools and a community college, while Adamstown train station is a few minutes' walk away. Viewings at the marketing suite tomorrow and Sunday, between 11am and 1pm.